Sternal Puncture: A Method of Clinical and Cytological Investigation, Second Edition covers the study of the life history of the blood; clarifies problems in hematology; and observes the reactions of the formative elements of the blood to infection and to other abnormal states of the body. 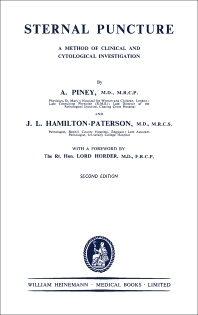 Chapters are devoted to the discussion on the myelogram and hemogram procedures; different infective diseases of the blood and various anemias; and a detailed description of the technique of sternal puncture. Hematologists, cytologists, and students of medicine will find the book very useful.